These waffles are perfectly sweet with a bit of crunch from the cornmeal and are topped with a warm, fresh blueberry syrup that's just perfect for a summer brunch. Breakfast is definitely my favorite meal to make on the weekends. I just love to get creative in the kitchen first thing in the morning! Whether I'm making omelets or pancakes or oatmeal, I enjoy changing things up all the time. I'm pretty sure my kids love it, too! Often times, especially on Sunday's, we will have brunch instead of breakfast. Then I really go all out! Homemade waffles or French toast, bacon or sausage, fresh fruit....all the fixins'. We go big! I try to get us nice and full, then we don't eat again until dinner time. It's something my mom did when I was growing up, and I've tried to keep the tradition with my family as well. Just two big meals for the day, with maybe a snack in between. When you think of cornmeal, most people naturally think of cornbread. I know I do! But because it's such a versatile ingredient, I thought it would be a perfect addition to these waffles. 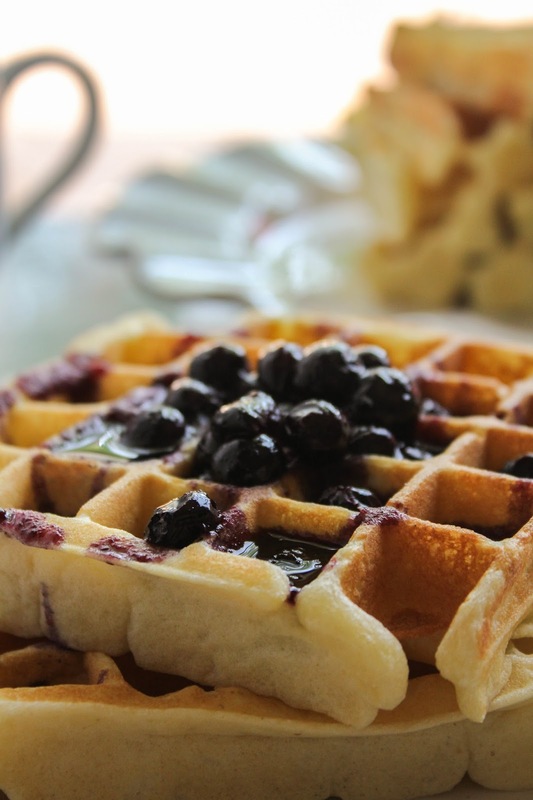 The fresh blueberry syrup is quick and simple to make, and will simmer away while the waffles are cooking. 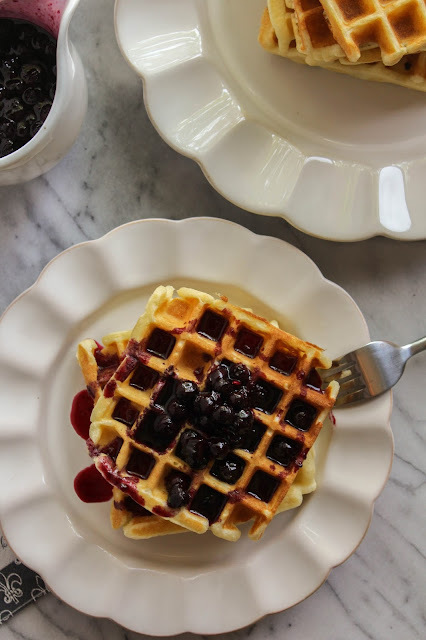 Whether you're looking for a new breakfast or brunch recipe, these cornmeal Belgian waffles with fresh blueberry syrup are calling your name! I guarantee you'll be making them again and again. Start off by making the blueberry syrup. Bring the water and sugar to boil in a small saucepan. Add the blueberries and cinnamon and reduce the heat to medium-low. Simmer for 10 minutes, or until thickened. Preheat a Belgian waffle maker on medium setting while you prepare the batter. Add all of the dry ingredients to a large bowl and whisk until combined. Add the wet ingredients into a small bowl and mix well. Add the wet into the dry and combine until smooth. Let the batter rest for 5 minutes before using. 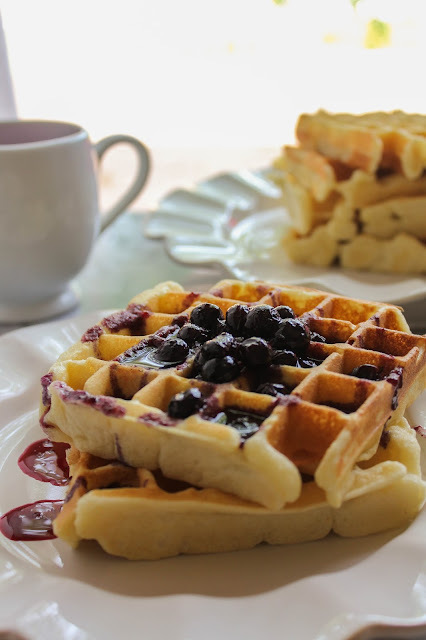 Pour about a quarter cup of batter onto the center of each of the four lower grids of the waffle maker and use the back of a spoon to spread it out evenly. Close the cover and cook until the waffles are ready. (Waffle makers vary, so follow the instructions on your particular model) Open carefully, remove the waffles and set them on a plate. Keep the waffles warm in a 200 degree oven while you cook the remaining waffles. 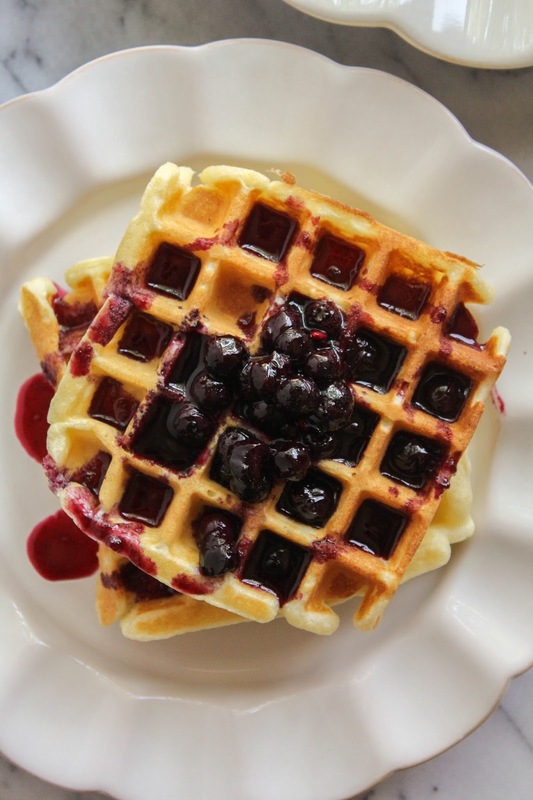 When all of them have been made, serve immediately with the warm blueberry syrup.